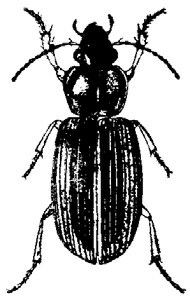 Ground beetles are occasionally a nuisance indoors by their presence. Homeowners may confuse these beetles for cockroaches, carpet beetles, woodboring beetles, or some other household structural pest. Others are simply curious about these insects after finding them outdoors under stones, logs, boards, and similar places. Some beetles are attracted to lights and enter the home by crawling through small openings and cracks in windows, doors, foundations, etc. Ground beetles normally live outdoors and do not establish themselves indoors. They are not dangerous to humans, domestic animals (pets), structures, or household items. If handled, some large beetles will pinch fingers with their strong mandibles (jaws) and emit noxious defensive odors. Common Black Ground Beetle Pterostichus spp. Adult ground beetles, referred to as "Carabids," are 1⁄16–1⅜ inches (12–35 mm) long, somewhat flattened, sometimes elongate, with threadlike antennae (11-segmented), narrow head (projects forward), and hard wing covers meeting in a straight line at the center of the back with numerous fine, parallel ridges running lengthwise. These active insects, with long legs, large eyes, and strong sickle-like mandibles, run rapidly, and are active mostly at night (nocturnal). Ground beetles are usually black though many are brilliantly colored or enhanced by iridescent, metallic blue, green, purple, reddish, or other bright markings. Many species are difficult to distinguish. These insects (predators) feed on other harmful insects and are regarded as very beneficial to agriculture. Larvae are elongate and wormlike in appearance with powerful prominent mandibles. They vary from dirty white to dirty yellow to almost black. Adults are about 1 inch long, oblong, flattened, and dull or reddish black with the wing covers deeply striated. They have brown antennae and black legs. Larvae are black with a reddish head and the body tapered with 2 long cerci (slender paired appendages). Adults feed on the larvae of Colorado potato beetle and others, ragweed seeds, and occasionally damage ripening strawberries, probably in search of needed water. They are very common and attracted to lights. Adults are nearly 5⁄16 inch long, head and thorax black (unusually slender) with the rest of the body much broader. Wing covers are reddish-brown, each with 3 black spots. They are cut off squarely behind and have tiny pits in rows above. Adults are found on vegetation; larvae in moist soil near cultivated fields and marshes. Adults are nearly 1 inch long and black with pale bluish, purplish, or violaceous reflections. Wing covers are striate and punctate. It is found in moist areas, under leaves, rocks, and logs in forests and lowlands. They feed on snails and slugs at night. Adults are about ¾ inch long, shiny, pitch black, with antennae slightly paler, wing covers rather deeply striated, a scarcely punctate head, very broad, and large jaws. They are commonly found in burrows, under stones, and in damp soil. Adults are 5⁄16 inch long, light or yellowish-brown bodied with a broad black stripe on each wing cover. The head is black while the antennae and legs are light brown and there are shallow furrows on the wing covers. This beetle is very strongly attracted to lights and large numbers are captured in light traps in early spring. They can cause some injury to seed corn and sorghum planted in wet soils or under conditions that retard rapid germination. Adults are 1–1⅜ inches long, with violaceous luster on sides of head and thorax, which are blue-black, legs black with bluish luster, wing covers metallic green with red margins, finely striated. This handsome beetle can climb trees in search of prey. It feeds on tent caterpillars, gypsy moth caterpillars and pupae, and other forest caterpillars. It is strongly attracted to lights. Adults are about ⅝ inch long, shiny black with the underside orange and wing covers deeply striated (furrowed). This common species is numerous in pastures, cultivated fields, and open ground. It feeds on caterpillars (cutworms and armyworms) and seeds. However, they will attack ripening strawberries lying on the ground. Both ripening and green berries may be damaged with the skin broken and the entire surface eaten. Adults are from ½–⅝ inch long, elongate, shiny black with prominent, lengthwise grooves on the wing covers. There are about 2,500 known species of ground beetles in North America. These active insects are usually found on the ground under rocks, logs, leaves, bark, decomposing wood, and other debris on the ground. When disturbed, beetles run rapidly but seldom fly. Most hide during the day and feed at night. Both adults and larvae are considered beneficial since they feed on larvae of many harmful insects. Some are considered pests when feeding on seedlings of crops planted in moist soil in early spring. Larvae usually are not seen whereas adults may be found on the ground underneath night lights. Eggs are normally laid singly in the soil and hatch into elongate larvae tapered toward the end. They have a large head directed forward. Pupation occurs in the soil. The life cycle of most species is usually completed within a year, although adults may live two to three years or longer. Some adults are attracted to lights and will feed on the crushed remains of their own kind that have been stepped on or run over. Many ground beetles exude or expel foul-smelling secretions that are used to repel their enemies. Some feed on snails and slugs. Remove objects where beetles can hide such as leaf piles, old boards, rotting logs, stone piles, firewood piles, etc., around house entrances. Caulk and screen potential entry ways into the home. Since many beetles are attracted to lights, subdue the lighting around windows and doors by using less attractive (to beetles) yellow or sodium vapor light bulbs. Avoid excessive lighting directly upon the house during the spring when beetles are abundant. Indoor lights should not shine directly out of door or window openings. Colored walls that do not reflect light are preferable to glossy white. Small numbers of live beetles found indoors can be easily collected by broom and dustpan and relocated outside far from the house since these predators are helpful in agriculture. Recent studies have also indicated that many of these predators inhabit mulch where other insects breed and serve as food for ground beetles. Keep mulch layers at the recommended depth of 2–3 inches in depth. If the landscape is regularly irrigated, perform a water audit and irrigate only when needed. Collect dead and dying beetles with a vacuum cleaner and proper attachments. Take extra care to preserve these valuable predators. Indoors, insecticide sprays or dusts can quickly kill any ground beetles that have gained entry, but these will provide no residual activity. It is just as effective to crush and remove the beetles or simply usher them back outside! Total release aerosols (commonly called bug-bombs) are also only effective at killing live insects. These will also provide no residual action. Prevention of entry of ground beetles is often accomplished through outdoor perimeter (barrier) treatments. Sprays or granular formulations of insecticides are applied around ground and plant beds surrounding a home or building. When selecting a material, be sure to read the label and determine if ground beetles are listed. Though some perimeter treatment products claim season-long control, most have to be reapplied on a regular basis if beetles persist in entering the structure. It is much better to use preventive practices than insecticides. Avoid chemical control if possible.